Bearing the brunt of the RAF’s incessant campaign were two heavy bombers, the stalwarts of Bomber Command - the Lancaster and the Halifax. Between them they accounted for over three-quarters of all the bombs dropped by the RAF, and Halifaxes alone accounted for a total of 73,312 operations, nearly a fifth of all missions carried out by Bomber Command. 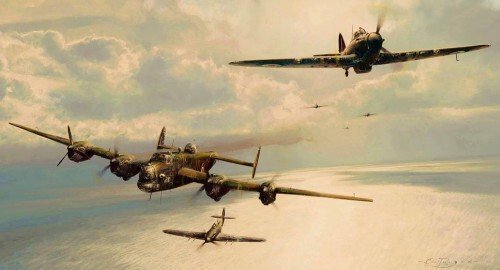 THE LIMITED EDITION Each print in the FOUR signature Limited Edition is personally signed by artist Robert Taylor, and individually hand-numbered; together with TWO RAF aircrew who flew Halifaxes during WWII, and TWO Hurricane fighter pilots. In tribute to those brave veterans who flew with the RCAF during World War II, each print in this SEVEN signature edition is signed by two RCAF Hurricane pilots and five RCAF Halifax aircrew, together with the artist Robert Taylor.